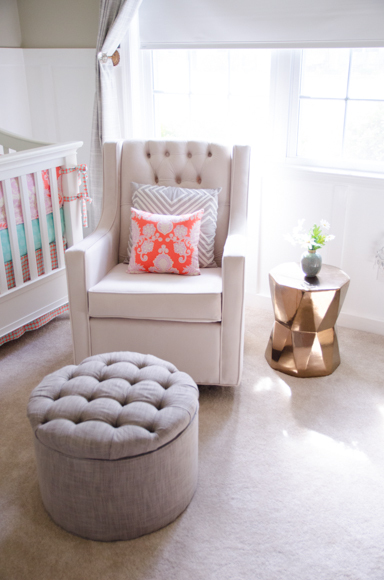 When I first sat down and created an inspiration board for Sienna’s nursery, I knew I wanted to use neutrals, metallics and punches of coral and mint. 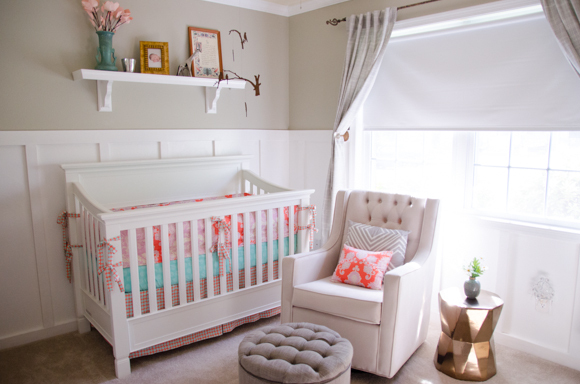 I wanted a more ‘grown up,’ vintage-inspired nursery that Sienna could enjoy for years to come. 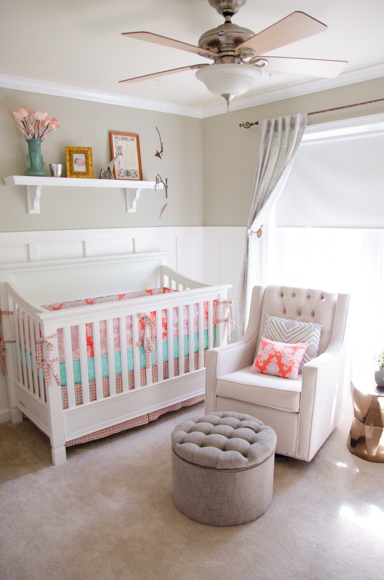 The room turned out just as I imagined, and I love that it is a serene and meaningful space that can be easily updated as Sienna grows. 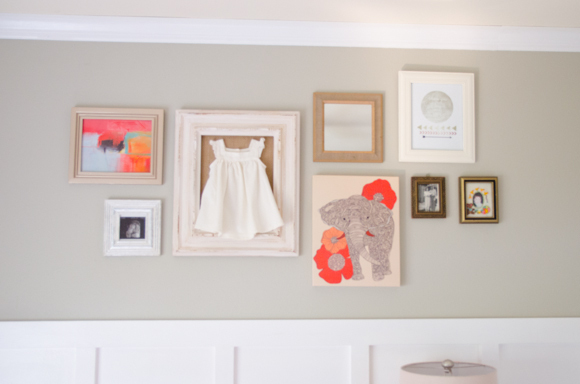 I knew I wanted to keep the wall color neutral, both to achieve the more sophisticated nursery look I was going for, but also so that if we wanted to sell our home down the road, we wouldn’t have bright coral walls that might be off-putting to potential buyers. 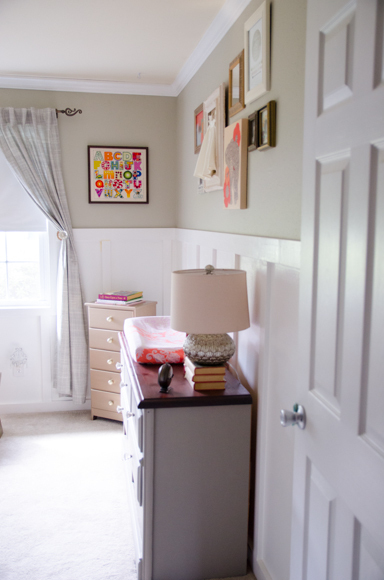 It was much easier and practical to keep the base of the room neutral and to decorate with pops of color. 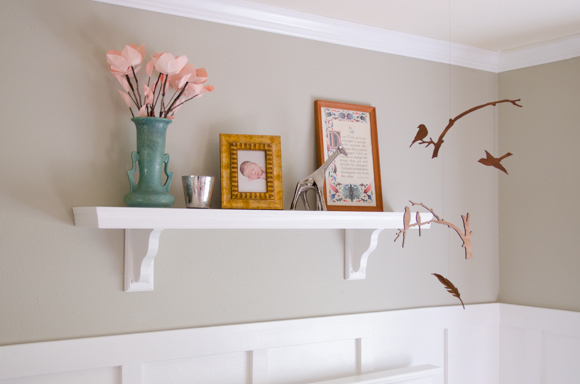 The hours we spent sanding, sawing, and painting to create the board and batten wall treatment were all worth it – this detail really pulls the room together for me. 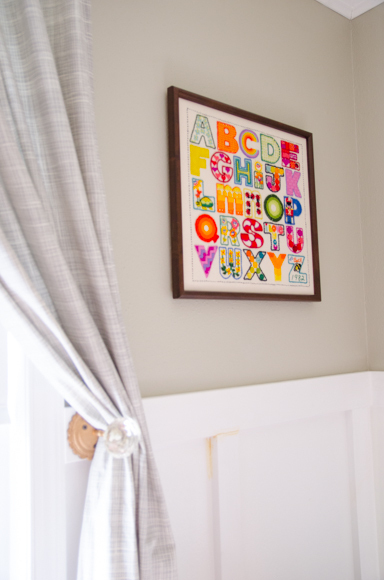 I added a lot of personal touches to the nursery, including books and toys from my childhood, a large ornate mirror, turquoise vase, and framed quote that used to reside in our family’s cottage, and embroidered alphabet art made for me by my mother when I was a baby. 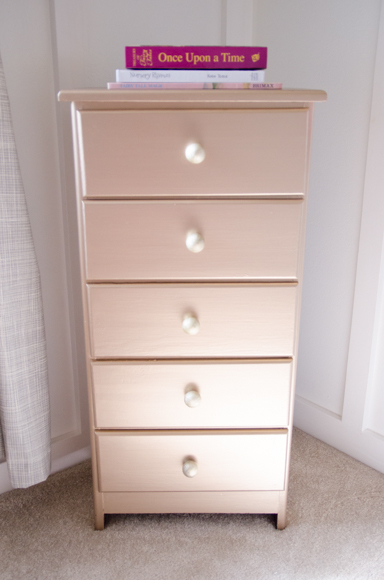 The small dresser was revamped with gold paint and new hardware, and is perfect for holding diapers, bibs, and washcloths. I knew from the beginning what fabric I wanted to use for the bedding, so I found an etsy shop that carried it and had her custom sew the bumper, sheet, skirt, changing pad cover, and pillow. 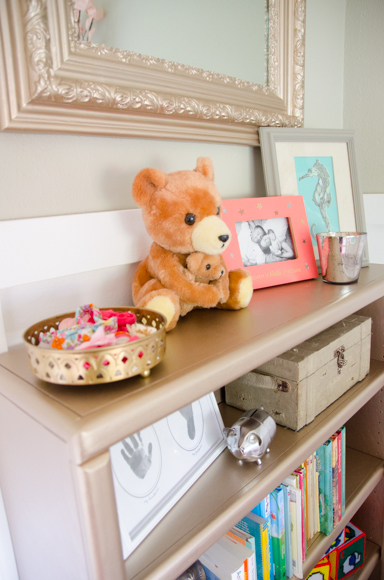 The chunky white shelf was a DIY project that Kyle and I tackled together. I spotted the bird mobile in another online nursery reveal and fortunately was able to hunt down the source! 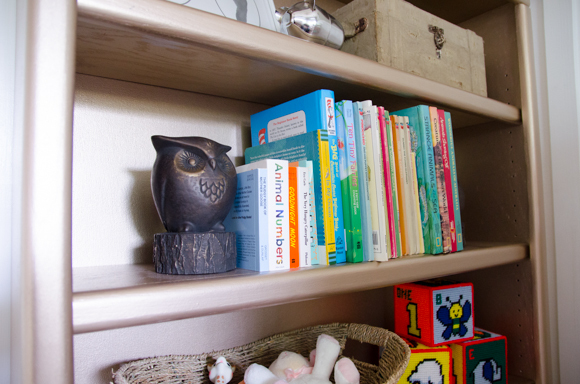 I definitely used a lot of gold paint in the nursery – this is the second transformation for this bookcase, which originally sat in our front room after I painted it a dark gray color. Most of the frames used in the gallery wall were thrift store finds that I painted and distressed. I bought two prints from etsy shops and also included one of Sienna’s ultrasounds and both my mother’s and my baby photos. The elephant canvas used to live in our bathroom, but when I realized that it matched the nursery’s color palette perfectly, I had to include it. 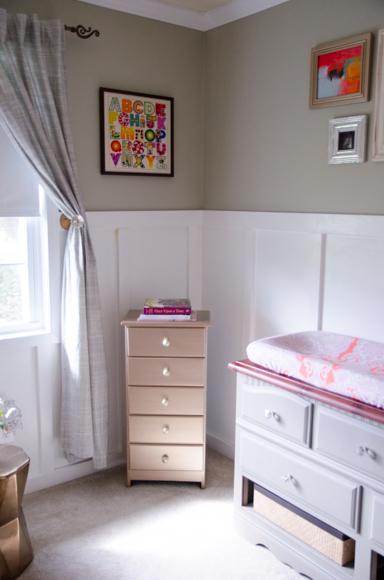 The dresser was another major DIY project for this room. New paint, stain, shelves, and hardware gave it a brand new look.